Political uncertainty remained a feature in the June quarter as President Trump dismissed FBI director James Comey and French and UK elections were held. In the EU, risk eventually retreated as the Centrist and Pro-EU candidate Emmanuel Macron won a convincing victory in the French elections. In the UK things weren’t quite as clear, with the snap election anticipated to strengthen the Conservative majority before Brexit negotiations, ended by eroding their majority. While commentary from Bank of England Governor Mark Carney and his EU peer Mario Draghi appeared to signal the days of stimulus were numbered and tighter monetary policy was ahead. In the US, the Federal Reserve looked through disappointing inflation figures to increase interest rates by 0.25%, while also detailing plans to reduce its balance sheet. Despite the rate move, the US dollar struggled due to the lack of movement within the Trump administration and other major developed economies signalling tighter monetary policy. The Bank of Japan offered the most upbeat assessment of the Japanese economy in years which was backed by strong corporate results, however the spectre of North Korea appeared to constrain any euphoria. In the rest of Asia, Chinese data improved during the quarter with Hong Kong following suit, while a new President in South Korea signalled a potentially reinvigorated economy and corporate governance reforms. Commodities were a drag during the quarter as Brent crude fell 9.3% and iron ore stockpiles built in China. OPEC extended production cuts, but the market was hoping for those cuts to be increased and when this didn’t eventuate the weakness in oil persisted. Meanwhile US oil production continued to rise further tempering oil strength as the US moved into summer driving season. Back in Australia, the biggest news of the quarter was a $6.2 billion levy on the big four banks and Macquarie Group. The following outlines the returns across the various asset classes to the 30th June 2017. Shares in developed and emerging markets delivered strong performances during the quarter, with Australia backing the positive trend. Emerging markets were the star with overall unhedged returns of more than 5.6%, while in developed markets outside Australia the returns were 3.6%. Australia was alone among developed markets in posting a negative return for the quarter at -1.54%. The Australian market was weighed down by weakness in banking due to the government’s announced bank levy, though telcos, energy, consumer staples and real estate investment trusts also played their part. Despite the lack of concrete movement on reform in the US, equities continued to push ahead with a strong corporate earnings season. Similarly, in Europe and the UK, corporate earnings helped underpin positive equity returns. In Asia, China pushed higher on investor optimism following a solid earnings season in blue chip stocks and the landmark decision by index provider MSCI to include Chinese A-Shares in its range of benchmark indices. Finally, the old whipping boy Greece was the strongest market index as the country reached agreement with Eurozone creditors for the release of an 8.5 billion loan tranche. Starting a Self-Managed Super Fund is quite an exciting prospect. No longer will an investor be constrained by the shackles of their tired superfund, an SMSF is an open road with untold freedoms ahead, but how to get started on that road? Luckily there are many eager experts out there ready to liberate investors from the boring returns of their banal old super funds and guide them into the riches of buying property within their SMSF. Let’s say you and your partner are both in your early fifties, have maybe spent 30 years working and have managed to (between both of you) accrue $250,000 in super. You may be with an industry super fund, maybe retail, maybe you have a financial planner, but for argument’s sake, let’s say the super fund costs are around 1% per annum or less. Let’s say it’s $2,000 to keep the maths easy. You also have an accountant who charges you $200 to do your taxes each year. Your “net worth” so to speak, to the finance industry is $2,200. But $2,200 doesn’t feed many hungry mouths. It certainly doesn’t contribute significantly to support an assortment of professionals who can help with your SMSF and find you the perfect property. Nor does it contribute to the black hole of state government coffers or pay thousands in interest to keep bank CEOs happy. To help all these people out, instead of paying your fees annually you could front load most of them and pay them up front so everyone can benefit now rather than having to wait for you to pay fees each year. This is why it’s a great idea to set up an SMSF and buy a property. Take that $250,000 from your super funds and set up an SMSF with your partner, you can then buy a brand new $700,000 apartment with a $500,000 loan (allowing $50,000 for stamp duty and expenses). Upfront fees. $1,000 to $3,300 to your accountant. Legals? $1,000 to $3,000. Stamp Duty: $30,000 to $40,000 depending upon the state. Bank Valuation and other fees $500-1,500. Sales commissions are officially paid for by the vendor, not you. But all that means is that the sales commissions on your new apartment are embedded in the price. Add another $10,000 to $30,000. Plus, now you have an annual $2,000 to $3,000 in accountants’ fees. And at 4.5% investor interest rates you are in for $22,500 in interest payments. You’re probably also now paying a financial planner to sign off on your strategy. At 1% that’s another $2,500. With gross rental yields around 4%, you get income of $28,000 per year. Then you pay strata, insurance, rates, letting fees etc which means you are probably losing a few thousand each year. Thankfully negative gearing gets you a discount. Oh. That’s right, an SMSF only pays 15% tax, which means there are almost no negative gearing benefits. Sure, you will wipe out close to 25% of your entire savings in upfront fees alone. And your annual fees are at least double what they were, maybe triple. But just look at the list of people who will benefit from your new SMSF: accountants, lawyers, governments, real estate agents and banks. That’s a lot of marketing and lobbying power – to convince you to put your super into property via an SMSF, and to lobby the government to keep the changes that allow you to borrow in your SMSF despite ongoing warnings and objections from independent observers. Well maybe not for you, but for everyone else in the game it makes perfect sense! With thanks to DFA Australia. This material is provided for information only. No account has been taken of the objectives, financial situation or needs of any particular person or entity. Accordingly, to the extent that this material may constitute general financial product advice, investors should, before acting on the advice, consider the appropriateness of the advice, having regard to the investor’s objectives, financial situation and needs. This is not an offer or recommendation to buy or sell securities or other financial products, nor a solicitation for deposits or other business, whether directly or indirectly. Read any good stock tips on the internet lately? If you listen to our advice, hopefully not! We’ve long pointed out the dangers of buying individual companies because of a lack of diversification and heightened risk, among other reasons. Now there’s another confirmed danger for anyone getting stock tips from internet sites and online newsletters – the tip writer may be a paid spruiker. Last month the US Securities and Exchange Commission filed fraud charges against 27 individuals and entities that were engaging in paid stock promotion without disclosing that fact. Essentially a listed company would hire a stock promotor or communications firm to generate publicity for their stock – with the end intention of increasing the price. Those hired would write overly positive articles about the company and have them published as reasoned analysis on various community based investment sites like Seeking Alpha. However, some managed to find their way onto more recognisable sites like Forbes. A timely reminder that on the internet anyone can be a lawyer, doctor, fund manager or commercial airline pilot – or all those people at once! Australia doesn’t have a shortage of stock promotion websites or email tip sheets. It also has a prominent stock trading forum that is listed on the ASX. All are geared to the spec end of the market. The stock promotion websites while clearly not transparent, are obvious in their intent – they wouldn’t exist without companies paying for promotion. Why? If a company’s share price is pushed higher they can raise capital at more favourable terms. The stock trading forum, while great entertainment, is wholly anonymous with administrators unable to deal with the one person acting as nine problem. In the age of VPNs or Virtual Private Networks the same person can sign into 9 different accounts from nine different locations without arousing suspicion of the website administrators. Again, the intent is to whip other less aware users into a frenzy to buy shares they own so the price rises and they sell with a profit – it’s called a pump and dump. While we’ve long pointed out the folly of stock pickers because they can’t predict the future, at the bottom end of the market they can become self-fulfilling. With smaller market caps the email tip sheets and membership websites have the ability to move shareprices on their own. This is the 2017 shareprice chart of a small resources company listed on the ASX. At the start of the year a tip sheet put a buy recommendation on the company. This was after the price of metal the company was looking to mine had steadily increased in price during the second half of 2016. Even better, in the first two months of 2017 the metal price increased over 50% as shown below. The company’s shareprice moved upward with the metal price. But by the end of February the tip sheet gave the call to sell, saying the metal was overvalued and it was time to take profits. As seen by the two charts, the metal price is slightly ahead of where it was at the end of February, while the company’s share price lost more than 50% of its value and is back below where it was tipped as a buy. It doesn’t take a cynic to believe those behind the recommendations bought and sold the company’s shares before making the same recommendations to their membership base. And the 23% fall in the share price and highest trading volume of the year following their sell call was clearly triggered by their membership base selling. Little has changed with the company, but emotion can breed contagion. Other shareholders unaware of why the shareprice was falling likely became spooked and sold out themselves. Driving the shareprice even lower. What’s the takeaway here? Individual shares are always risky. While promoted shares and recommendations on shares are doubly risky. You never know who is behind them and what their intentions are. It’s why a portfolio should be invested across multiple funds, asset classes and jurisdictions. No one can pump and dump a diversified portfolio. Global policy makers expressed a cautious welcome for continuing signs of improving activity during the March quarter. The Reserve Bank of Australia noted a pick-up in global trade and industrial production, alongside a tightening of labour markets. In the US, economic data continued to be supportive. Non-farm payrolls were robust and activity indicators buoyant. Manufacturing purchasing managers’ index (PMI) increased and the consumer confidence index rose to its highest level in 16 years. Reflecting the improving outlook for growth and inflation the Federal Reserve increased rates by 0.25% in March. Optimism over Donald Trump’s plans to cut taxes, boost infrastructure and reduce the regulatory burden, however, the failure to pass changes to healthcare legislation raised doubts over Trump’s ability to implement some of his policies. In the Eurozone, the period started on a weak note, with negative returns in January, but sharemarkets picked up as the quarter progressed. Economic data released during the period was largely positive. Leading indicators showed gains with the flash composite purchasing managers’ index reaching a near six- year high of 56.7 in March. Inflation, as measured by the consumer price index, picked up to 2.0% in February, albeit slipping back to 1.5% in March. The Bank of England upgraded its 2017 UK GDP growth projection (from 1.4% to 2.0%) due to stronger-than-expected consumer spending following the “leave” decision in the EU referendum. After weakening at the end of 2016, the Japanese yen appreciated gradually in the past three months. From Japan’s perspective, the main political event was the meeting between Prime Minister Abe and President Trump which was surprisingly cordial despite the previous US rhetoric around trade and Japan’s foreign exchange policy. In China, better-than-expected data and a stabilizing yuan led to improved sentiment among investors. Ongoing restrictions on the property market and a tightening on capital outflows also saw liquidity diverted into equities. Energy was a commodity laggard. Crude oil fell 6% over the quarter amid doubts over the sustainability of an OPEC-led output deal. Oil producers Norway and Russia were the worst performing developed and emerging markets respectively. The following outlines the returns across the various asset classes to the 31th March 2017. Global equity markets delivered mostly positive returns, led by emerging markets. The Australian market was a top performer, with healthcare companies being a standout with consumer staples following. However, a stronger Australian dollar trimmed gains from other developed markets for unhedged investors. US equities performed well as the S&P 500 advanced 6.1%, Information technology was the top-performing sector, followed by consumer discretionary and healthcare. The quarterly earnings season was a positive one for European equities, with many firms reporting double digit earnings growth and confident outlooks for 2017. The information technology sector was the top performer, followed by utilities and industrials. The Japanese sharemarket traded in a tight range throughout the quarter, registering a total return of just 0.6%. In China, stocks gained strongly and had their best first quarter in over 10 years, driven on by continued positive news for the world’s second-largest economy. The emerging markets posted strong gains, with US dollar weakness providing a tailwind for returns. Real Estate Investment Trusts experienced negative returns for a second consecutive quarter, although this came after several years of strong gains. Midway through the quarter Warren Buffett released Berkshire Hathaway’s annual letter to shareholders. Most notable was Buffett highlighting his now million-dollar charitable bet with an asset manager that no investment pro could select at least five hedge funds to keep pace with an S&P 500 index fund over ten years. Buffett publicly offered the wager back in 2006. However, in an industry where active managers base their performance on beating indices such as S&P 500, only one man, Ted Seides of Protégé Partners, stepped up to take Buffett’s challenge. Seides picked five funds (which would not be publicly disclosed) and their performance would be averaged and then compared against Buffett’s choice of Vanguard’s S&P 500 index fund. After nine years the results haven’t been good for the hedge funds. The average return of the hedge funds over the past nine years was 2.2% per annum meaning $1 million invested would have gained $220,000. In contrast the inexpensive index fund Buffett chose returned 7.1% pa, which is a ballpark return for US or Australian sharemarkets over longer periods of time. The gain on $1 million invested would have been $854,000. You’ll note, if this performance is consistent in the final year of the bet, Buffett’s investment will double in ten years, while the hedge funds will have just kept ahead of US inflation. I’m certain that in almost all cases the managers at both levels were honest and intelligent people. But the results for their investors were dismal – really dismal. And, alas, the huge fixed fees charged by all of the funds and funds-of-funds involved – fees that were totally unwarranted by performance – were such that their managers were showered with compensation over the nine years that have passed. Further complicating the search for the rare high-fee manager who is worth his or her pay is the fact that some investment professionals, just as some amateurs, will be lucky over short periods. If 1,000 managers make a market prediction at the beginning of a year, it’s very likely that the calls of at least one will be correct for nine consecutive years. Of course, 1,000 monkeys would be just as likely to produce a seemingly all-wise prophet. But there would remain a difference: The lucky monkey would not find people standing in line to invest with him. We would note if it came down to a monkey or an active investment manager, there’s no guarantee of exceptional performance from either, but the monkey’s fees will be much more reasonable. The dangers of basing investment strategies on media forecasts were highlighted dramatically in 2016 as the outcome of major world events and the market reaction to them confounded pundits. The major news event was Donald Trump’s US presidential election win. The Republican outsider defeated Democrat Hilary Clinton on a platform that tapped into voter anger at “insider” politics and the effects of globalisation. Similar sentiments also fuelled the mid-year vote by Britons to leave the European Union, again a largely unheralded result that led to the resignation of Conservative Prime Minister David Cameron. Despite these potentially destabilising events, equity markets rallied through the second half of the year – the UK FTSE-100 index reaching record highs in October and the major US indices hitting a succession of historic highs later in the year. This was a stark contrast from January & February when the focus was on China’s economy and bottom dwelling oil and commodity prices. The steady US economic recovery, falling jobless rate and uncertainty over the Trump administration’s policies were cited by the US Federal Reserve in December when it raised its benchmark interest rate after a year-long pause. GDP growth in China, meanwhile, hit a 25-year low of 6.7%. The government supported the economy with spending on infrastructure, though international bodies such as the IMF and OECD expressed concern at rising levels of debt. Growth in the EU area also remained subdued, despite continuing accommodative monetary policy. The European Central Bank expressed concern about potential knock-on effects of Brexit to the EU and of the Trump presidency to populist movements in Europe. In Australia, the hangover from the end of the mining investment boom lingered. In only the fourth such occurrence since the 1991 recession GDP shrank in the September quarter as businesses, consumers and government all cut spending. The RBA cut interest rates twice in 2016, but also expressed concern at the effect of low rates on housing prices and household debt. Banks were urged to strengthen lending standards. The following outlines the returns across the various asset classes to the 31th December 2016. After the January rout, share market sentiment began to shift from mid-February and bar a brief sell-off after the UK vote in late June, the overall trend was higher. Global GDP growth slowly picked up, while commodities bounced as supply eased and investment pulled back. Internationally, the US equity market was one of the best performers over the year, alongside those of commodity producing economies such as Canada and Norway. Energy and materials sectors were among the top gainers. A similar pattern was evident in emerging markets, with energy and materials topping annual sector tables and commodity producers such as Russia (oil) and Brazil (iron ore) the best performing countries. India and China were largely flat over the year. Locally, the Australian and New Zealand share markets were among the best performers in the developed world. The Australian market rose by nearly 12%, led by resource stocks. The NZ market hit record highs in August, before retracing, though ended up nearly 9% over the year, its seventh annual gain in eight years. Value stocks were strong performers on the Australian market, while there was a more modest premium from small cap stocks over the year. Australian and international fixed interest finished stronger over the year, although both were punished in the final quarter as US Treasuries sold off after the Trump victory. The chart below highlights some of the year’s major news events in context of broad Australian market performance. These headlines are not offered to explain market returns but to show that investors should view daily events from a longer-term perspective and avoid making investment decisions based solely on the news. The performance of markets in 2016 underscored once again the dangers of basing one’s investment strategy on the news cycle or of acting on opinions and forecasts of media and market pundits. It also highlighted the importance of investors diversifying across different assets and different countries, while staying disciplined within the plan designed for them. Every December The Australian newspaper has an end of year feature offering its top 100 financial picks for the year ahead. They generally comprise shares, managed funds, mortgages, credit cards and other financial products. For the past three years, we’ve followed the share picking section of the list with interest – knowing that for the most part, while they will have some success, share pickers usually fail to beat the market, especially over the long term. In 2013 The Australian’s 66 share picks offered 31 winners and 35 losers, they combined to provide a 8.86% loss. The wider ASX (price only) returned 14.76%. In 2015 The Australian’s 53 offered 20 winners and 33 losers, however they combined to provide a 13% return – an anomaly that came down to the 724% return of Bellamy’s Organic. We know how that winner eventually turned out – one of the bigger disasters of 2016. The wider ASX (po) returned a 0.82% loss. In 2016 The Australian hit one out of the park – 35 winners and 25 losers for an overall return of 20.67% against the wider ASX (po) return of 7.01%. On the surface the share pickers vs the market now looks to be a 50/50 proposition after four years, even if The Australian’s losers outnumber the winners, but if we compare the full returns across those 4 years it becomes a different story. The ASX (price only) has an average annual return of 5.40% against the 4.15% from The Australian’s picks. And if you started with $10,000, the market would be on $12,260 vs $11,406 for The Australian. But while picking shares is a common thing, few people invest solely in the ASX index. They do invest in diversified portfolios though. Adding an actual portfolio into the mix makes this comparison more realistic. In this instance, we’ll add a portfolio with 70% growth assets (local, international shares and listed real estate) and 30% defensive assets (local, international fixed interest and cash). As you can see the difference is stark. A diversified portfolio has delivered an 11.52% annual return since 2013 and grown to $15,407. The Australian trails both the portfolio and the ASX. Not only is the portfolio more diversified, it’s enjoyed the benefits of higher returns from international shares, fixed interest and listed real estate to improve its return. While we’re happy to congratulate The Australian on their past two years, their outperformance can be attributed to one company’s performance in 2015 and two companies in 2016. Does that sound like good judgement or good luck? The diversified portfolio’s return can be attributed to thousands of companies, bond funds and real estate trusts spread throughout many of the world’s economies. What would you rather be relying on? Well here we are again. After the Brexit vote earlier in the year we’ve again witnessed a public vote having a real-time impact on financial markets. The US voting to elect Donald Trump as President. Markets spent the last week before the election reacting to polling numbers. Firstly, there was a sell off when Trump moved back into contention, but in the final two days a surge to Clinton pushed up equities, commodities and the Australian dollar. When reality set in, markets around the world tumbled. The initial fallout in US market futures was slightly worse than during the Brexit vote, but that’s to be expected given the vote wasn’t on the periphery of the US, it was the US – the world’s largest economy. Trump taking the lead during the vote count proceeded to knock more than 5% off the S&P 500 futures in the space of four hours, with the ASX falling in sympathy. However, 16 hours later, with Trump as the President-elect, the S&P 500 was higher than it was when a Clinton victory seemed assured. This market whiplash once again underlines why we continue to preach the gospel of staying disciplined when investing – never make a short-term decision about a long-term portfolio. When something unexpected like this happens it’s always best to ignore your investments. Markets always gyrate when a shock comes. It may be for hours, days or maybe weeks. Never buy into a boom, never sell into a storm. If you have a balanced portfolio then your bonds will soar as your stocks fall, mitigating the impact. So why the sell off and why the turnaround? As we said after Brexit – financial markets love certainty and they hate uncertainty. Clinton was certain and Trump was not which explains part of it, but the selloff also appears to signal gamblers at play. The financial market surge before the election likely signalled many people were gambling on Clinton being a sure thing. When it went the wrong way, the selloff started as they looked to unwind their positions before they would be seriously in the red. Not that markets care about Clinton, but Trump soothed fears that the world was ending and enemies would be hunted. He started to speak like a politician. Markets like that. They then digested the possibility of investment stimulus and tax cuts. They liked those too. Finally, remember this: the media pundits and columnists who were wrong about everything for the past two years, will be the same ones lining up to tell you what they think will happen next. Ignore them. The only certainty from here is uncertainty. On Friday we witnessed a significant event and its real time impact on financial markets. Britain voting to leave the European Union. Despite a final week “Remain” rally that pushed up equities, commodities and the Australian dollar, someone was clearly reading the tea leaves the wrong way.Financial markets love certainty (Remain) while they hate uncertainty (Exit) and they certainly hate this outcome. However, this is just another bump (or dip) in the investing journey that will likely look remarkably benign when we look back on it in the years to come. This decade, still living with the lingering aftereffects of the Global Financial Crisis, has seen several market shaking events. The Japanese Earthquake and Tsunami rocked world markets in 2011, while markets were less than overjoyed when the US had its AAA rating clipped by S&P later that year. And just when investors have started to feel comfortable this decade, ongoing fears about China and Greece would rear their heads to unleash waves of volatility. But… where was the worst place to be invested? The old “safe haven” of cash of course. There are some rough moments in there, but Australian listed property leads the way with an annualised 13.60% return, while cash has returned investors an annualised 3.50%. Australian shares have managed an annualised 6.23% and International shares an annualised 11.91%. Anyone ignoring all the market shaking events along the way has inevitably done better than someone who kept themselves safe in cash. There’s inevitably more uncertainty to come, but there are some things that are certain. The UK government could seek to ignore such a vote; to explain it away and characterise it in terms that it has no credibility or binding effect (low turnout may be such an excuse). Or they could say it is now a matter for parliament, and then endeavour to win the parliamentary vote. Or ministers could try to re-negotiate another deal and put that to another referendum. There is, after all, a tradition of EU member states repeating referendums on EU-related matters until voters eventually vote the “right” way. Despite the celebrations and glum faces we’ll see in the media, Britain can’t just leave the EU tomorrow. The Lisbon Treaty demands a negotiating period with the European Council of up to two years. Fortunately for markets and unfortunately for the exit voters that’s plenty of time for all manner of goodies and interventions to possibly convince the UK to stay… let’s wait and see..
Do Politics Matter To Investment Returns? If you’ve spent any of your time listening to talkback radio or reading discussions online you’ll know wading into politics can be a dangerous game. Hot-headed people escalate arguments at the drop of a hat over the fortunes or criticism of their side. So when politicians wade into our own industry or our areas of expertise we tend to keep our commentary muted. Except to say despite their posturing, neither side knows much about regulating financial planning, and like everyone else who doesn’t own a crystal ball, politicians know absolutely nothing about economic & investment forecasting. For the most part, beyond individual regulatory decisions for specific industries, politicians don’t have much of an impact on the wider share market or your returns if you’re properly diversified, yet it doesn’t stop investors wondering and politicians expecting us to believe otherwise. The emergence of Donald Trump seems to have a lot of people nervous for various reasons and questions are being asked about any impact he could have on world markets. In a similar vein this week, government minister Peter Dutton told us “I think the stockmarket will crash” under Labor. Like any good investment newsletter spruiker Mr Dutton didn’t offer any clear reasoning, but he did get his intended headline. Maybe Mr Dutton has another career in mind, selling gold or alternative investments, where he has to talk the sharemarket down, but in this instance he’s giving Labor too much credit. Similarly, Donald Trump has many people spooked, ascribing doom scenarios to his potential ascension to the US Presidency given some of his statements. However, flick through Trump’s 1987 book “The Art of the Deal” and you’ll be reminded Trump prides himself on attracting attention and manipulating the media. He argues it is part of his business strategy because a newspaper column (good or bad) was always cheaper than advertising. Furthermore, talk of Trump being a loose cannon starts to fall apart when he’s already assembled an advisory team comprising former New York Mayor Rudy Giulliani and two members of President Ronald Reagan’s administration. Trump might be successfully selling himself as an anti-establishment politician, but it’s more likely just another Trump sales tactic. Bringing us to sharemarket returns under political parties since 1980. Firstly in Australia from the time each political party took office, as measured by the ASX All Ords Accumulation Index. There is an advantage to Labor on the chart, but no one could truly suggest either side played a significant part in the returns they enjoyed, or suffered, during their governance. Both Labor and Liberal had to deal with significant meltdowns on world markets that flowed into Australia and impacted our market. In the US, from the time each President took office until they left, as measured by the S&P 500. In the US the returns are quite impressive for both parties, with double digit annualised returns under Reagan, Bush I, Clinton and Obama. The only outlier is George W. Bush who suffered from the collapse of the dotcom bubble, a collapse of the housing market and a major terrorist attack on US soil. You’d have to be overly partisan to draw investment conclusions from either of these tables, so we’d suggest not to worry about who is in charge and just vote for the old favourites – diversification, asset allocation and taking the risks that are historically worth taking. Ten years ago, in another country, a man we’ll call Bill, died at 75. He left his wife, a lady we’ll call Betty, $50,000 and a house worth $350,000. Betty was 65, living on a government pension and no longer wanted the hassle of the house. So she sold it, but before leaving she asked her next-door neighbour for advice on investing the proceeds. Her neighbour pointed Betty towards his financial advisor. Soon Betty was set up with a portfolio that paid her rent and offered her income in addition to her pension. Betty’s portfolio fell by 25%. Despite her funds still doing what they were designed for – paying rent and offering additional income, Betty panicked, ignored her advisor and sold at the bottom. She dumped the remaining cash into a savings account as the country’s central bank was slashing interest rates. Within a year the central bank had cut interest rates to almost zero. Over the next few years Betty’s money sat in the bank earning next to nothing. The funds she cashed in recovered their losses and continued to pay distributions. Betty continued to make regular withdrawals from her cash, only they were smaller as she attempted to conserve her cash. Interest rates never recovered and now Betty’s withdrawals have nearly eaten away all her cash. We tell this story because we’re all human and can be easily frightened. Markets have had an extremely poor start to the year and the media has piled on. The biggest headline recently came with the Royal Bank of Scotland telling investors to “sell everything”. The strategist behind the call was Andrew Roberts. Roberts suggested we were in for a global deflationary crisis and warned investors to brace for a cataclysmic year. We’re not saying Roberts and RBS are wrong, because we don’t know what comes next, but few in the media offered any perspective to the call. You may recall the sequel to the Great Depression never happened in 2010. What to do about the current turmoil? It’s unknown if the share market will go down further before it goes up again, so the hardest thing to do is also the best thing to do – nothing. Andrew Roberts’ appeal to base emotions will resonate with many people, just like 2008 spooked Betty. They’ll believe this time is different and it’s time to bury their cash in a vegemite jar. The reality is this isn’t anything new; declines like we’ve seen in 2016 are an annual occurrence. Over the past 30 years the average intra-year decline on the ASX is 12%, and in 23 of those 30 years the market still finished the year positive. If your portfolio is well diversified then you can weather these declines. Investors drawing income can do this from cash and defensive assets and rebalance their portfolios when share markets improve. We ensure most of our clients in drawdown phase have at least 5 years of defensive assets available so that growth assets don’t need to be sold in a downward market. For clients in the accumulation phase of their lives, it is an opportunity to buy equity assets at cheaper prices. Accumulators and investors with longer term investment strategies can accrue additional assets at lower prices or they can simply allow some time for their asset prices to recover. As always still feel free to contact us if you have and questions on this or any other issue. The scale of China’s economic slowdown and the policy response to it were among themes that preoccupied global markets in the September quarter. On August 11, China devalued its currency by nearly 2%, a move that fuelled concerned about the success of China’s efforts in rebalancing its economy from investments and exports to domestic consumption. Given China’s substantial demand for iron ore, coal and other raw materials, concern about its slowdown was cited as one possible factor – alongside supply issues – in driving down commodity prices, resource stocks and related currencies like the Australian dollar. In the US, China’s slowdown was cited by the Federal Reserve as they delayed an anticipated increase in interest rates. Despite this, Fed governor Janet Yellen said she still anticipated an increase before the end of the year. Central banks elsewhere also maintained accommodative interest rate policies for similar reasons. Across the Atlantic, data showed a recovery in European business sentiment. In August, Greece, secured a third bailout from its creditors in return for promising to carry out economic reforms. Late in the quarter, the emergence of the Volkswagen emissions scandal raised concerns at the impact on the German economy. The car marker, whose CEO quit over the rigged emissions tests, is one of Germany’s largest employers. 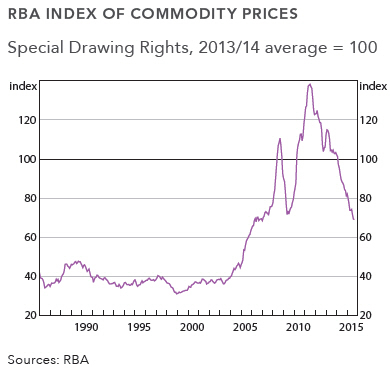 In Australia, the commodity downturn hit resource companies and resource rich regions like Western Australia. With the economy slowing and inflation contained, the Reserve Bank kept the cash rate at 2%, where it had been since May. The following outlines the returns across the various asset classes to the 30th September 2015. Global equity markets in the September quarter posted their worst quarterly performance in four years, led by emerging markets and more specifically commodity and energy related shares. Exxon Mobil Chevron, Glencore and BP were among the biggest drags on global equity markets, though there were positive contributions from some technology and consumer names such as Amazon, Google, Facebook, Nestle and Nike. Unsurprisingly the weakness spilled over into commodity related currencies, with the Brazilian Real, South African Rand and Australian Dollar among the worst performers against the US dollar. Fading expectations for inflation made for good bond returns, with longer-dated government bonds posting their biggest quarterly gain of 2015, while the search for yield in a low interest environment helped to lift listed real estate. Again, more evidence of the benefit of diversification – as local shares sunk, other asset classes behaved in a completely different fashion. On the Australian share market, energy companies like Santos and Origin were among the worst performers, though merger activity boosted some industrials like Asciano and Treasury Wine Estates. Qantas, continuing its turnaround and benefiting from low oil prices, posted strong gains. In New Zealand, it was a similar story to Australia, as the local share market also posted its worst quarterly performance in several years, but NZ bonds posted strong quarterly gains. Was there a time without volatility? It’s been a volatile year, apparently. The market has moved around quite substantially and the media has been on the scene to remind us about it. If there’s one constant that keeps the media in business it’s retelling an old story and trying to tell us it’s fresh and relevant – curse our short memories! If we could remind ourselves how common and ultimately uneventful market volatility and most corrections are, we’d endure a lot less stress when investing. With that in mind, to highlight how the worst periods during a year are often markedly different from the whole year, we’ve put together a 30 year chart of the ASX highlighting intra-year declines vs. full year returns. The message? Corrections happen regularly – but they’re rarely fatal. This chart underlines the danger of reading too much into a temporary correction and taking action based upon it. Significant drops happen at least once on a yearly basis and if we take the worst declines (those included for this this chart), they average 12% down before the market forms any type of recovery. There are a few things to note. Firstly, on three occasions the yearly return was worse than the worst intra-year decline measured. A 10% fall can happen in a short period of time; from there the market may form a small recovery or trade sideways over a number of months. From that point if it starts another fall it will inevitably drag the yearly return lower. Thankfully the fall/reprieve/fall scenario has only occurred three times in the last 30 years. Secondly, even good years will suffer rough declines. 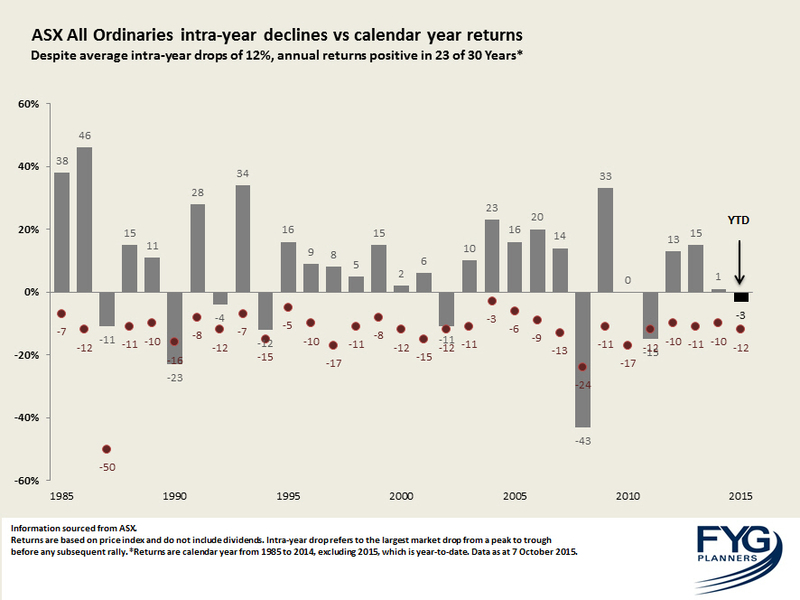 2012 and 2013 produced solid double digit returns, but at one stage during both of those years they suffered double digit peak to trough falls before recovery. And take 2009, as the world reeled from the financial crisis. The ASX had hit a double digit decline by early March, something that would have most investors questioning their strategy to stay the course, but from that point the market staged a remarkable recovery and finished the year 33% ahead. If you’re a long term investor it’s just another reminder that there’s nothing to be feared from a correction. Now the following chart isn’t the art work of an indecisive snail that fell into an ink pot, it’s just further evidence volatility is nothing new. 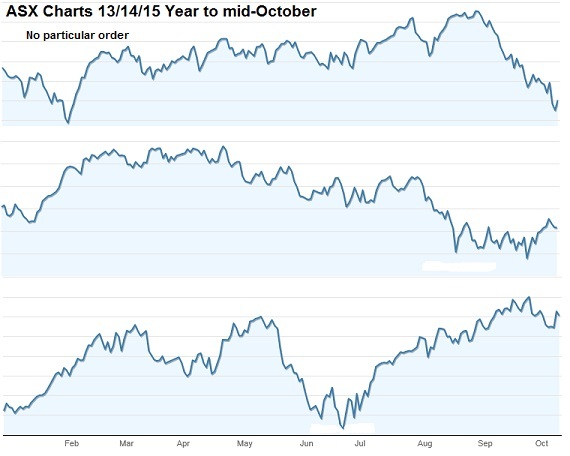 The combined lines are three ASX charts from 2013, 2014 & 2015. They are through till mid-October and the charts are deliberately untagged and in no particular order. Despite the media playing on the idea that “volatility is back in 2015” it appears hard to identify any real difference in volatility between the three charts. Volatility has neither remerged, nor has it been absent in any of the charts. There are roaring ups and downs, with little smooth sailing to be found. Has it really been a volatile year or just a normal one? In truth it’s been both – markets are always volatile and that’s normal. The global economic backdrop remained mixed in the June quarter. Continued recovery in the US and modest gains in Europe and Japan were offset by a continuing slowdown in China, weak commodity prices and Greece’s recurring debt woes. Globally, monetary policy remains highly accommodative. However, the US Federal reserve has declared its intention to raise interest rates sometime this year if key indicators continue to strengthen. Across the Atlantic, despite an easing of deflation fears and small signs of an economic recovery, the European Central Bank kept rates at record lows and continued its quantitative easing program. In Asia, the economic news was also mixed. In Japan, business sentiment improved as the economy emerged from a recession trigged by last year’s hike in sales taxes. Meanwhile China grappled with slowing exports, manufacturing and its property market. In late June, China’s Central bank cut interest rates for the fourth time since November. For Australia, the falling terms of trade and low growth in labour costs depressed incomes. The fall in mining investment, as major projects have come online, has yet to be replaced by new growth. Central banks in Australia and New Zealand were both torn between heated housing sectors and falling commodity prices, yet opted to cut interest rates to offset weakening overall demand. Late in the quarter, Greece’s five-year-long debt crisis came to a head after the breakdown of marathon talks with its international creditors. The prospect of a Greek default unnerved markets and raised concerns of a break-up of the 19-nation Euro currency block. The following outlines the returns across the various asset classes to the 30th June 2015. A strong start to 2015 for equity markets gave way to a more mixed picture late in the second quarter as attention moved to the prospect of higher US interest rates and the future of Greece in the Eurozone. Despite the late June dip that dragged quarterly returns down, over the full financial year most asset classes delivered solid returns. Currencies boosted unhedged global equity returns through the year as the $USD rose in anticipation of a US rate hike, though this effect waned in the June quarter. Global indices ended largely flat for the quarter as the Greek debt crisis eroded gains towards the end of June. The UK was the top developed market in Australian dollar terms, while the US market was mostly unchanged. Emerging markets were flat over the quarter, with small companies beating large and value companies beating growth. China was the standout market across the financial year, even with a heavy fall in June, the Shanghai Composite Index was still up over 150% for the year. The Australian market lagged those offshore, dropping 6.5% for the quarter to reduce its full year return to 5.6%. Again, most of that damage was done in the last weeks of June as the market reacted to Greek debt, China’s share market tumbling and the RBA talking down interest rate relief. That was a bad few weeks… or was it? Q: I am concerned at all the turbulence in the markets and wonder if I should move my share-based investments inside super to cash until things calm down. That question was put to financial advice columnist Noel Whittaker on July 14. Noel offered an uninspiring one sentence response; so we thought we’d go into a little more detail and analyse the timeframe that inspired this question. Due to Greek debt and Chinese gamblers, world markets suffered significant volatility across June & July. If you were just reading the headlines or heard general news reports when the media decided the sharemarket’s falls were big enough to warrant reporting on, you’d likely think it was a horrible span of a few weeks and investors were left significantly in the red. While the market falls came at exactly the wrong time for anyone using the end of the financial year as a measuring stick, 14 days into the new financial year and the market was actually higher than it was a month earlier – a time of relative calm when no one was yet talking about Greece! While Greek’s debt saga could drag on further and China’s stock market gamblers could sell up when restrictions are lifted or get a second wind, this past month serves as an important lesson in how to handle volatility. We’ve compiled a chart of the ASX All Ords from June 15 to July 15, we’ve then superimposed some headlines taken from the Australian Financial Review that highlight how quickly the media whips between light and dark stories, some amusingly timed. The chart also highlights the volatility a sharemarket can endure during a one month period (with some significantly down days); yet still end that month higher than it started. If you expand the chart, you’ll note the warnings on Greece started 15 days before the deadline and become more apocalyptic as the 30th of June grew closer, aligning with the market declines. At the absolute bottom we were told “Greek saga set for a catastrophic turn” only to see the market race higher. At the next peak the headlines said “The Panic Has Gone – For Now” only to see the market take a large drop. Many of the headlines appear to have awkward timing to them – seemingly relentless market declines are followed by headlines of more horror to come and at that moment the market sharply turns upwards. Or just when the headlines say “don’t panic” the market moves sharply downward. If you truly want to get something out of this chart, we’d ask you to imagine yourself looking at the ASX close on June 15 at just under 5,500 points. Then imagine you went on holiday for a month to Tropical Island with no communications, meaning you had no idea what the market was doing. Then imagine you arrive home on July 15 to find the ASX close at just over 5,600 points. Would anything that happened between those two dates have really mattered to you? And if you wanted to exit, when would be the right point to wait for calm to re-enter? As investors we need to remember short term sharemarket charts often appear as disconcerting as the period between June 15 and July 15, meaning there’s no chance of correctly picking “when things will calm down”.